This works! Smells just right and with only 23% beechwood smoked malts. Oftentimes brewers use copious amounts of smoked malts and manage to muddle the flavor up so much that its hard to tell if you are even drinking beer. Not here thankfully. Smells and tastes just like Bamberg intended. I feel that brewers must hammer out what they feel is a good foundation beer before branching out into uncharted libations and The Blind Pig has done that with this great statement beer. It’s as if they are speaking directly to SmokeBeerMinistry and saying, “Yes, we know how to do Rauch, so are we allowed to go forward?” SBM responds with a nod. Chart info is also below, but to sum up (and get this down before I forget); nose -4.5 , smokepower taste- 5, opacity – 3.3, sausage- Y, overall- a respectable 5.8. Much stronger than the across town competitor, but still shy of the 6+ mark, which could probably be achieved by bumping up the smoked malts to 30%-35% range… maybe more. Well done Blind Pig, quite the refuge in the middle of an Illinois February. 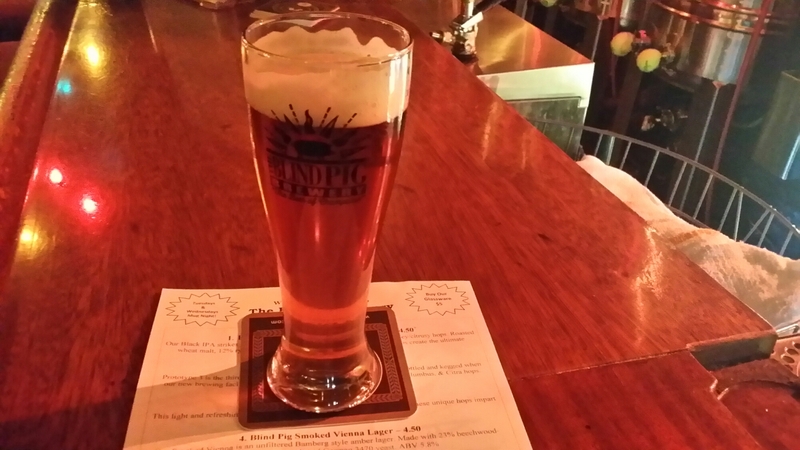 Brewer’s Description Smoked Vienna Lager is an unfiltered Bamberg style amber lager. Made with 23% beechwood smoked German malt and German 3470 yeast. This entry was posted in Beer, Educate, Enlighten, rauchbier, Smokebeer and tagged 5 - 6, beechwood, Blind Pig, draft, Illinois, lager. Bookmark the permalink.